The Tool Kit allows users to access over 200 resources organized by specific topics within the transitioning care process, including practical tools, evidence-based research, case studies, country-specific information, and many other resources. 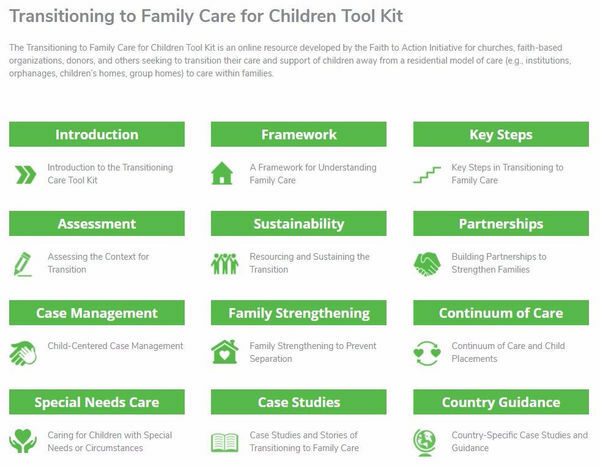 This in-depth, online resource, from our friends at the Faith to Action Initiative, equips churches, faith-based organizations, donors, and others seeking to transition their care and support of children from residential care models to care within families. This Tool Kit has been translated into both French and Spanish languages. Learn about key steps in transitioning to family care. Discover tools to help resource and sustain the transition to family care and build essential partnerships. Watch videos and webinars that raise awareness about the importance of family. Examine case studies detailing the experiences of and lessons learned by others. Share the Tool Kit with pastors and faith-based orphan care organizations. Highlight the Tool Kit in your newsletter and blog or add a link to Tool Kit on your website. Promote the Tool Kit using your social media platforms and website.